The crown-of-thorns starfish population has grown so large that it is no longer sustainable. For they eat the coral reefs. 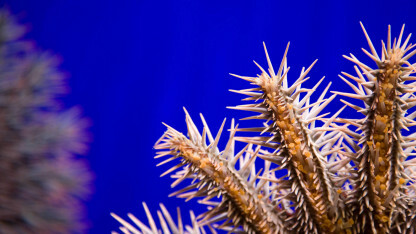 The crown-of-thorns is a poisonous starfish that eats living coral. It is a fascinating creature that can be seen in the National Aquarium Denmark – Den Blå Planet’s exhibition. In the Red Sea, at the Great Barrier Reef and elsewhere around the world, the numbers of crown-of-thorns starfish have exploded. The crown-of-thorns starfish has become so pervasive that it is no longer sustainable. “The navigational ability of the crown-of-thorns starfish” research project studies the sight and navigational ability of the crown-of-thorns starfish. The objective is to determine how they find the coral. The hope is that in future this knowledge can help to combat the crown-of-thorns starfish in areas where they threaten coral reefs. Partners: Anders Garm & Ronald Pitie, Department of Biology, University of Copenhagen.